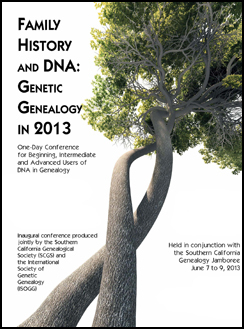 Co-sponsored by the Southern California Genealogical Society and the International Society of Genetic Genealogy as a prequel to the SCGS 2013 Jamboree, yesterday’s first-of-its-kind event was a stunning success. More than 300 people from all over the world — seriously, there are attendees from Australia, China and more — came together in Burbank, California, for presentations ranging from basic introductions to using DNA testing in genealogy to finding the families of adoptees to using high-tech third party tools to understand the results. To put it mildly, it was wonderful. Dr. Spencer Wells, head of the National Geographic Geno 2.0 project, was the keynote speaker, focusing on what he called his “biggest surprise” as head of the Genographic Project: the number of people who sought to join the Project to contribute to scientific knowledge and the growing role of citizen scientists in advancing genetic genealogy. Wells pointed out that citizen scientists were not a new phenomenon — that men like Charles Darwin and Benjamin Franklin could be counted in those ranks, and that the first major crowdsourcing was the 1900 Christmas Bird Count organized by the Audubon Society. After Wells’ keynote address, attendees broke out into individual sessions on “Chromosome Mapping for Genealogical Purposes” (by Tim Janzen, M.D. ), “Genetic Tools: What They are and When to Use Them” (by Bennett Greenspan of Family Tree DNA), and “The ABCs of DNA” (by me). Afternoon sessions included “Finding Family with DNA Testing: An Adoptee Success Story” (Richard Hill); “DNA and Family History: Getting the Most out of 23andme’s Genealogy Features” (Joanna Mountain, PhD, of 23andMe); “Using Third-Party Tools to Analyze Your Autosomal DNA Results” (Blaine Bettinger, JD); “Genetic Genealogy: Beginner Basics” (Emily D. Aulicino); “Autosomal DNA Testing for the Genealogist” (CeCe Moore); “Mitochondrial DNA: Tools and Techniques to Go Beyond Basics” (Debbie Parker Wayne, CG, CGL); “Famous DNA” (Katherine Hope Borges); “An Inside Look at AncestryDNA” (Ken Chahine, PhD, JD, of AncestryDNA); and “The Changing Y-DNA Haplotree and Its Impact” (Alice M. Fairhurst and David Reynolds). Sessions were standing room only right through the end of the day, and attendees were pleased to learn that three of the speakers — CeCe Moore, Blaine Bettinger and Debbie Parker Wayne will team up to coordinate a week-long course on genetic genealogy at the 2014 Genealogical Research Institute of Pittsburgh. National conferences… are you paying attention? The full week course will be July 20-25, 2014 and details will be available on the website at http://www.gripitt.org/ long before registration opens in February 2014. I just wanted to thank you for presenting in your “Ethical Genealogist” talk, a thoroughly insightful and needed discourse on a subject that all of us who do research desperately need to hear and take to heart. There are always other people involved in what we do and we have to remember that the living always take precedence over the dead. I deeply appreciate the time you took to personally discuss my own personal DNA dilemma. I have known about this issue for over a year but I did not grasp until I spoke with you, how much I needed to be able to discuss this with someone who understood ALL of the implications. You took time out of your busy schedule to stop and listen to someone who needed some advice. I thank you. Thanks for the kind words, Kristin, and I’m glad I was able to help you work through your thoughts on your issue. Ethical considerations are certainly tough things to deal with… but you were already about 99.8% down the road to what seems to me to be the right answer anyway. Thank you so much for agreeing to be part of this first-of-its-kind event. It was wonderful to spend time with you and read the stellar reviews of your speech (I wish I could have seen them all!). CeCe, it was such an honor to be included. Thank YOU and ISOGG and SCGS for putting it together! I am looking forward to next year’s conference on the East Coast! It should be terrific, Ginger!